Perforated steel design with a clean, modern appearance. 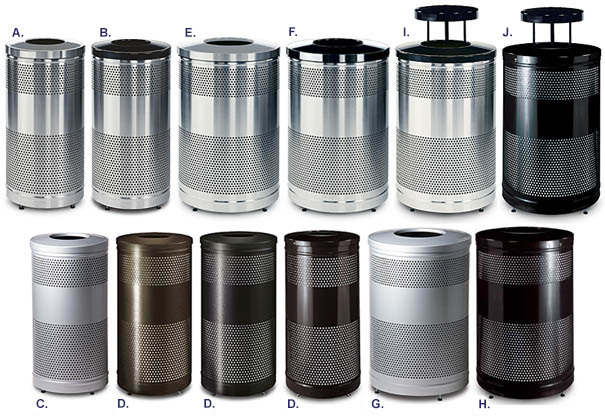 These heavy gauge, hot dipped galvanized and powder-coated or stainless steel trash receptacles come with adjustable leg levelers to hold them off the ground and provide stability on uneven surfaces. Extra security with a cable secured top. Also includes retainer bands to hold any plastic bags securely out of sight. Durable, hot-dipped galvanized steel construction with UV stabilized polyester powder-coated finish provides strength and beauty. Large capacity plastic liner included. Germ-Fighter® polyethylene inner containers control odors and germs. Optional anchoring kit is available.